"Gag grouper? That's our money fish," said Mike Colby, a charter boat captain out of Clearwater, Florida, on the state's western shore. "That's what brings customers to the dock." But since 2010, Gulf of Mexico gag grouper have been managed under a rebuilding plan that stipulates shortened fishing seasons for recreational fishermen and lower quotas for commercial fishermen. "We spent several years with a very poor gag fishery," Colby said, and it hurt his business. "What do you sell to your customers? People want to yank and crank." Today, business is looking up for Colby, who owns a 40-foot charter vessel, The Double Hook. NOAA Fisheries recently declared the Gulf of Mexico gag grouper stock rebuilt, and regulators will likely allow more fishing in the coming year. That's good news for fishermen, for coastal communities, and for the Gulf of Mexico ecosystem. 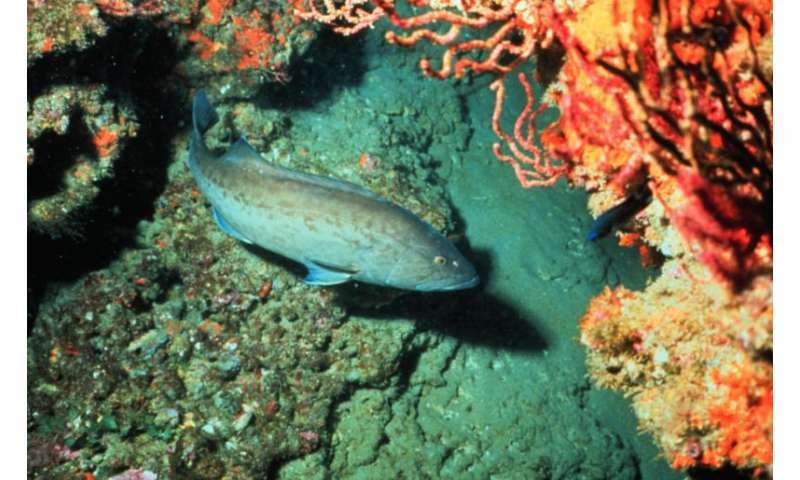 NOAA Fisheries recently released its annual Status of Stocks report, which shows that gag grouper and two other stocks—golden tilefish and butterfish—were rebuilt in 2014, for a total of 37 stocks rebuilt since 2000. This year's report also shows that the number of stocks on the overfished and overfishing lists are the lowest they've ever been. These successes were made possible by the Magnuson-Stevens Fishery Conservation and Management Act, the law that governs our nation's marine fisheries. The Act requires science-based catch limits, an end to overfishing, and the rebuilding of overfished stocks. At least two things caused gag grouper to become overfished. First was increased fishing pressure as the number of people—and recreational fishing boats—grew quickly along Florida's Gulf coast in the 1990s and early 2000s. And with gag grouper being the highest-priced fish in the Gulf of Mexico reef fish complex, commercial fishing increased as well. But the other cause had nothing to do with fishing, but rather with environmental conditions. In 2004 and 2005 the Gulf experienced large red tides. The runaway algal growth that caused the red tides also depleted the water column of oxygen, suffocating the fish. "We drove through acres and acres of dead gag. Big ones that you would think could swim away from a red tide event," Colby said. "They were belly up, like cobblestones you could walk across." The stock had low population growth for the next several years and NOAA Fisheries declared it overfished in 2009. "We had to put in some very stringent management measures to turn things around," said Andy Strelcheck, NOAA's deputy regional administrator in the Southeast. Those included a shortening of the recreational season from 10 months to 2 and a reduced bag limit, as well as significant cuts in quota for commercial fishermen. Typically, overfishing happens when fish are caught faster than they reproduce. But even if fishing is kept at sustainable levels, environmental factors can sometimes unexpectedly contribute to a stock becoming overfished, as happened with the red tide and gag grouper. But where overfishing is a factor, the Magnuson-Stevens Act requires that it be corrected. For that reason, chronic overfishing no longer happens in U.S. waters, even if temporary conditions of overfishing occur from time to time. And once a stock is found to be overfished, the law requires that regulators put a rebuilding plan in place that will get the stock back to the size that supports its maximum sustainable yield—the largest long-term average catch that the stock will support. That's what happened with gag grouper. The latest stock assessment, conducted in early 2014, indicated that gag grouper has rebuilt to sustainable levels. In light of these findings, the Gulf of Mexico Fishery Management Council will likely consider a longer season and higher catch quotas later this year. When it comes to rebuilding stocks, the usual story you read in the news has fishermen demanding more fish and regulators holding them back. But in this case it's the fishermen who are taking the more cautious approach. Based on what they're seeing on the water, many Florida fishermen are saying that the stock should be given a little more time to rebuild before harvests are increased. This inversion of the usual storyline shows that everyone involved shares the same goal—a sustainable fishery—even if they sometimes disagree on the particulars. The Gulf Council will take these opinions into consideration when setting new season lengths and catch limits. But on the question of whether our fisheries laws are working, both scientists and fishermen tend to agree. "The successes we're seeing with gag grouper, and also with many other stocks, are a direct result of two things," Strelcheck said, "the sacrifices made by commercial and recreational fishermen, and the new requirements added to Magnuson in 2006." "We shouldn't start screwing around with the science-based aspects of the 2006 Magnuson reauthorization," Colby said. "I'm 64 years old, and I've seen this movie before. You start messing with those requirements, and we're going to go back to overfishing. I guarantee it."